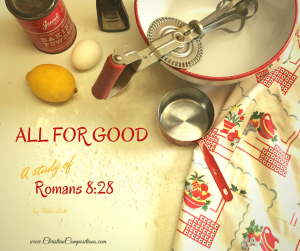 I am very excited to share with you this Bible study for ladies entitled, “All for Good“. It is a study of Romans 8:28. In a class or group setting, it is designed to be taught in one or two lessons. The personal study is 18 pages, and takes a journey through much Scripture to discover how God works all things together for good to them who love Him. -This is for those who wish to do this study on their own. It includes a welcome letter, 18 pages of study notes, fill-ins, questions, and projects. -If you enjoy teaching with PowerPoint, this package includes everything that is in the Group Package, plus all of the PowerPoint slides and a PowerPoint Summary sheet with room for notes. “Look Inside” preview pages are available for each of the products. If you have further questions before ordering, please feel free to contact me. If you order the download package, please note you are purchasing the right to make copies for your class or group. Please do not share the download files with others. As always, this Bible study is based on the King James Version of the Bible. If you use this study, I would love to hear from you! Please feel free to e-mail me, comment on this post (I do check all comments before making them public, so it may not appear immediately), comment or message me through Facebook, Twitter, or Instagram. What do you think worked well in this study? What could be improved? P.S. If you know other ladies who are looking for KJV Bible studies, please share! This entry was posted in New Products, Uncategorized and tagged All for Good, Christian Compositions, King James Version, KJV, Ladies Bible Study, Romans 8:28. Bookmark the permalink.